BETHLEHEM (Ma’an) — A few weeks before an Israeli soldier shot him through the stomach, Mutaz Zawahreh discovered a love of the sea. On the coast of Brittany, Mutaz and two friends from Duheisha refugee camp, Murad Ouda and Issa al-Saifi, amazed the French by running into the frigid waters of the north Atlantic. The three Palestinians spent two months in France as part of an educational program organized by a center in Duheisha. But as their visit progressed, the first signs of unrest began to show in the occupied Palestinian territory, and the three grew anxious to return home. Mutaz’s brother, Ghassan, had begun a hunger strike in an Israeli prison to protest his internment without charge, and his health was beginning to deteriorate. 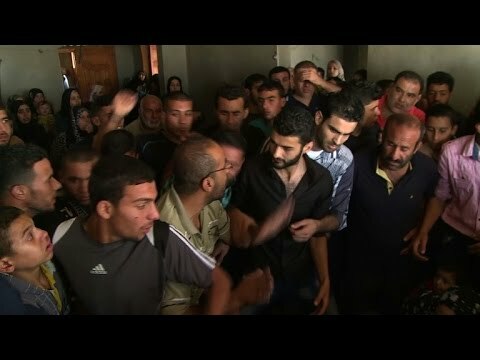 The three returned, and several days later Ghassan ended his hunger strike when Israel agreed to release him in November. But the brothers never saw each other. On Oct. 13, at a demonstration before Israel’s separation wall in northern Bethlehem, Mutaz was shot dead, the 30th Palestinian to be killed by Israeli forces in under two weeks. Mutaz was one of thousands of young Palestinians no longer able to contain their anger when he joined the protesters in throwing stones at Israeli soldiers. Only before the wall, “facing their weapons with his body,” was Mutaz able to give expression to his feelings, his friend Murad said. “He couldn’t take it anymore,” said Murad, especially after he had seen “how free life could be” in France. For Murad, the protests that have swept the occupied Palestinian territory in recent days are only “the tip of the mountain,” the outward expression of what he called an “internal intifada” that has been raging within most people for years. In Duheisha refugee camp, their childhood was marked by routine clashes and terrifying night raids by Israeli soldiers who would ransack their homes and take away their family members. As they grew older, they faced a constrained economy lacking in opportunity and severely restricted freedom of movement. Mutaz himself had been working two jobs when he was killed — as a hotel security guard and a taxi driver. Most of his male relatives had spent time in prison. While anger has driven the recent wave of protests, there have been few attempts to channel that anger. The protests have been been marked by a lack of leadership and organization. Factional leaders — at both a national and community level — have played almost no role in the protests, while the Fatah-led Palestinian Authority has committed itself to acting against them. Murad said that the lack of leaders was the result of Israel and the PA having worked for years to remove anyone who might effectively challenge the status quo. Growing up in Duheisha, Murad and Issa can recall regular community gatherings to discuss the camp’s issues — whether political or social — but in the absence of leaders, those meetings have largely stopped in recent years. Murad pointed, for example, to Nidal Abu Aker, an outspoken journalist and community leader in Duheisha, who has spent nearly 15 years of his life in Israel’s prisons. Abu Aker recently ended a 42-day hunger strike he undertook together with Zawahreh’s brother, Ghassan, and is set to be released in November, but Murad said he did not think it would be more than a few months before Abu Aker was re-arrested. Devoid of leaders, there has been little sense of strategy to the protests, and some commentators have suggested that it is in both Israel and the PA’s interest to simply let the young Palestinians “vent” their rage. Issa acknowledged that Palestinians risking their lives to throw stones at Israel’s separation wall were unlikely to cause Israel any material damage. But at this stage, he said, no other options had been left, after decades of negotiations and attempts to apply international pressure had ended in failure. The protests are the cry of a Palestinian generation that has felt for too long that no one is listening to them. Issa said that, ultimately, he believed it was not so much strategy as it was the mentality of his generation, their refusal to forego freedom, that Israel feared. While the recent wave of protests may calm, that mentality was not going away. Issa said that during their trip to France, the three friends had not been able to understand how the French themselves did not run to the sea every day. It were almost as though they did not understand the value of their own freedom, he said, and the three friends laughed that perhaps the French were somehow more “lost” than they were. “At least here we had something to fight for,” he said.